The Defenders of Midgard sourcebook for D&D is here, expanding the world of Midgard! With 7 new themes including the Clockwork Mage, Corsair, Emissary, Midgard Elementalist, Pantheist Priest, Planewalker, and Siege Mage, there's lots of new builds and options that work especially well in the Midgard Campaign Setting. 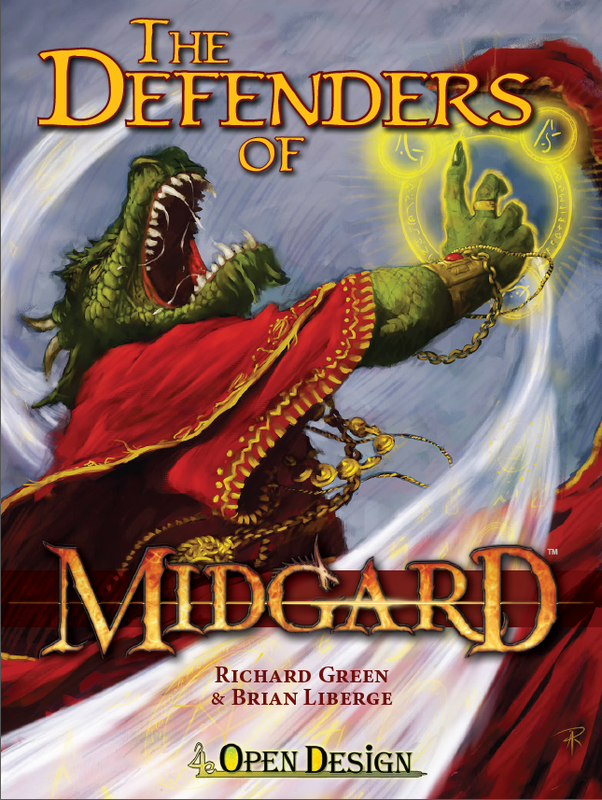 The Defenders of Midgard also includes new Backgrounds, 2 new Schools of Magic (Clockwork Magic and Glyph Magic), and plenty of great new Midgard Gear, designed for easy adaptation to a homebrew campaign or any published setting. For Midgard fans, there's even alternative Racial Powers for the Gearforged race originally presented in Kobold Quarterly #16. 4th Edition D&D players now have a toychest that offers more options and new powers suited to a Dark World of Deep Magic. 24 pages, full color throughout.